Terrorism news, reports, and publications – ISIS, al Qaeda, interactive map depicting worldwide terrorist attacks, a new strategy to prevent terrorist attacks, Hezbollah, Global Terrorism Index 2016, and more. 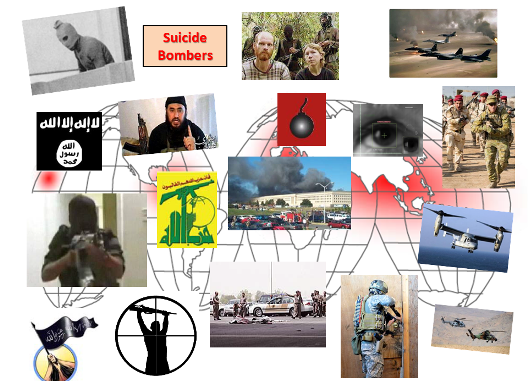 Report – The Jihadi Threat. The United States Institute of Peace and Wilson Center have published a 48-page report entitled The Jihadi Threat: ISIS, al Qaeda, and beyond, December 12, 2016. Map of Terrorist Events. The IntelCenter.com has posted an interactive map that depicts the number of people killed in terrorist and rebel attacks by country in 2016. More than 25,000 people were killed in 10,000 plus attacks according to the database of IntelCenter as of mid-December 2016. Interview with Hezbollah’s 2nd IC. Robin Wright visited Lebanon and recently spent some time with a head official of Hezbollah. Read about it in “Having Tea With Hezbollah’s No. 2”, The New Yorker, December 13, 2016. New Strategy for Confronting Terrorism? Shannon N. Green of the Center for Strategic & International Studies (CSIS) has penned a paper entitled “Do we need a new strategy to prevent terrorist attacks on the United States?”, CSIS, December 15, 2016. Crime and Terror in Europe. Colin P. Clarke, a political scientist at RAND Corporation, writes on the merging of crime groups and terror organizations in Europe. Read Crime and Terror in Europe: Where the Nexus Is Alive and Well, RAND Corporation, December 13, 2016. Global Terrorism Index 2016. A 108-page report by the Institute for Economics and Peace has recently been published. The report provides a summary of terrorist events, a map of terrorist incidents, terrorist trends, terrorist groups, economic impact of terrorism, and more. Read Global Terrorism Index 2016.